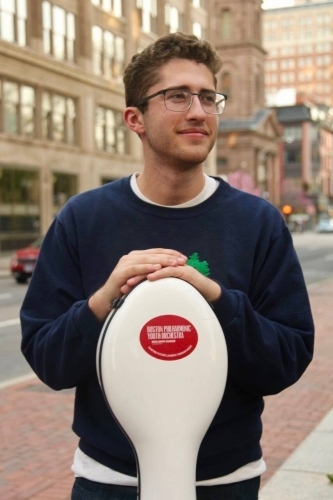 Iverson Eliopoulos is a sophomore at Tufts University and has been studying cello with Emmanuel Feldman since 2014. His passion is orchestral music, whether it be playing, studying, or just listening to. He is currently principal cello of both Tufts Orchestras and has been a member of the Boston Philharmonic Youth Orchestra since 2015. Summer festivals include New England Music Camp, where he won their Concerto Competition, and Boston University Tanglewood Institute where he played in the orchestra for two years, participating in masterclasses with Norman Fischer, Mihail Jojatu, and Owen Young. Iverson can often be found introducing people to the amazing world of classical music by bringing them to concerts (he has attended the Boston Symphony every week for four years!). He also is an amateur french horn player and thinks he is really a brass player at heart. He plans to pursue conducting in graduate school.